American educator; born in New York city Oct. 12, 1855. She was educated in the public schools of New York and at the Normal College, and did postgraduate work at New York University. From 1884 to 1903 she was principal of public school No. 77, and in the latter year was appointed a district superintendent of schools, being the first woman to be chosen to such an office in New York city. She was a pioneer in many school-reform movements, particularly in regard to special training for mentally enfeebled children; and has written on educational subjects in the "Educational Review," "School Journal," "School Work," etc. 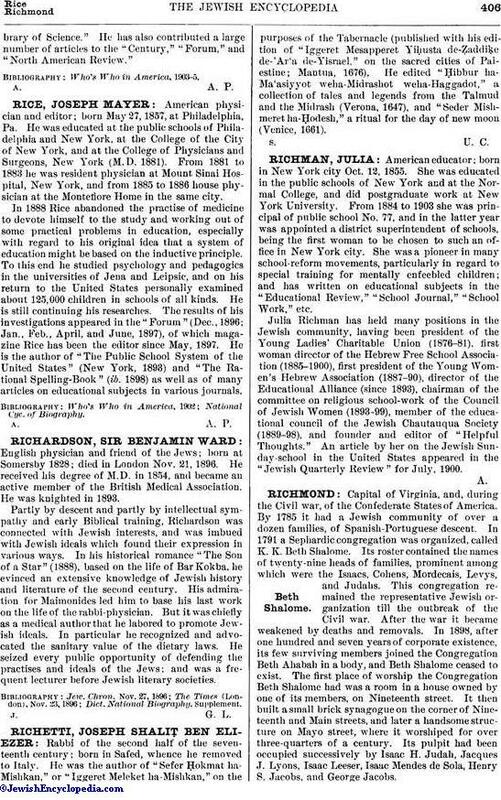 Julia Richman has held many positions in the Jewish community, having been president of the Young Ladies' Charitable Union (1876-81), first woman director of the Hebrew Free School Association (1885-1900), first president of the Young Women's Association (1887-90), director of the Educational Alliance (since 1893), chairman of the committee on religious school-work of the Council of Jewish Women (1893-99), member of the educational council of the Jewish Chautauqua Society (1889-98), and founder and editor of "Helpful Thoughts." An article by her on the Jewish Sunday-school in the United States appeared in the "Jewish Quarterly Review" for July, 1900.